Do Nuclear Weapons Are Also a Hoax? Why a 4 400 kg heavy Atomic Bomb with only 61 kg of uranium-235 did not work 1945 and does not work today ... or ever! The free Neutrons couldn't do it! We are all told at school or reading books or learn one way or another that a first atomic bomb - a Weapon of Mass Destruction, WMD - was dropped by US Air Force on Hiroshima, Japan, in the morning of August 6, 1945, to end the 2nd World war. A second atomic bomb was dropped on Nagasaki a little later to really stop the war. BBC suggests it happend like this! Oliver Stone also belives in the atomic bomb and should study this article. In a nuclear explosion, energy is released from the formation of different atomic nuclei by the redistribution of the protons and neutrons within the interacting nuclei (sic), whereas the rapid oxidation of fuel elements (carbon and hydrogen atoms) is the main source of energy in the case of chemical explosions. … The detonation of a condensed high explosive generates hot gases under pressure up to 300 kilo bar and a temperature of about 3000-4000C°. … The hot gas expands forcing out the volume it occupies. 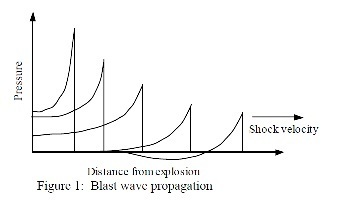 As a consequence, a layer of compressed air (blast wave) forms in front of this gas volume containing most of the energy released by the explosion. Blast wave instantaneously increases to a value of pressure above the ambient atmospheric pressure. This is referred to as the side-on overpressure that decays as the shock wave expands outward from the explosion source. After a short time, the pressure behind the front may drop below the ambient pressure (Figure 1). During such a negative phase, a partial vacuum is created and air is sucked in. This is also accompanied by high suction winds that carry the debris for long distances away from the explosion source". It is suggested by many 'experts' that a nuclear explosion, if it really can take place, generates a blast wave with pressure of a million bar and a temperature of a million °C. Such an atomic explosion would evidently cause more damage than a simple chemical (napalm) bomb. Bank of Japan building 1946 at Hiroshima - 380 meters sideways from and about 600 meters (1 800 feet) below the alleged 'atomic bomb' explosion and blast wave center 1945! Downtown Hiroshima 1946! No 'atomic bomb' exploded and produced a blast wave here 1945!